a liker script - "stm32_minimal.ld"
All it does is first kill any OpenOcd process already running; then start a new one to read the config file sent as the first argument, find and write the binary image as specified in the second argument into the micro with multiple commands. Like what's in the Makefile, we could've typed all those commands one by one in the shell but that would be much more time-consuming. 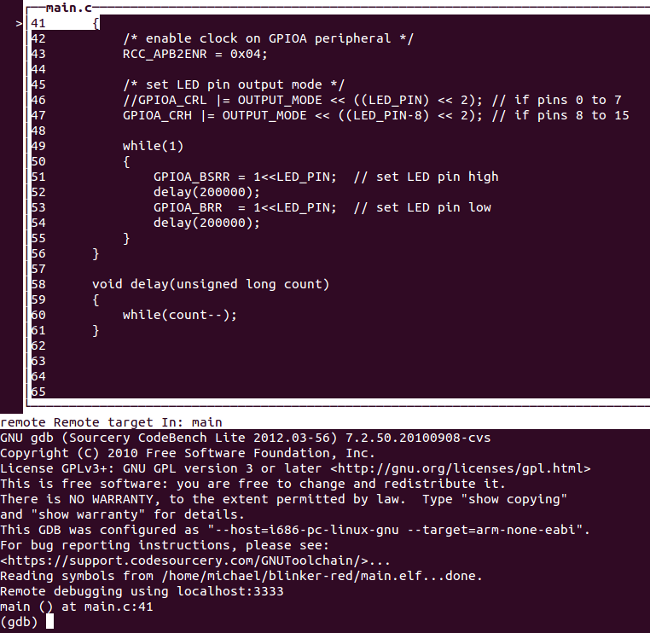 When done, type 'q' to quit GDB. The linker script is not really complete, it doesn't accommodate data such as initialized global variables. The stack size is not defined. The vector table is not fully populated, which makes it hard to use interrupts. All the peripheral register addresses were defined in 'main.c'. In the next section I'll show a more complete linker script, use a startup file and bring the STM32 peripheral library into the picture.